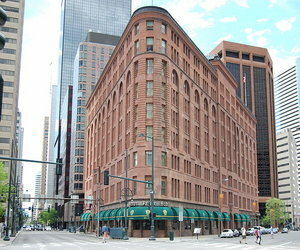 The Brown Palace in Denver, Colorado is reputed to be haunted by many locals, as well as many who visit the location that are professional paranormal investigators. This immense structure currently serves as a hotel for the traveling public. In the year of 1892, a man by the name of Henry Brown opened the hotel. It is a known fact that, throughout the history of the building, it was never closed for business. However, it has been brought up to date through its history through numerous renovations. It is believed that this structure serves as a resting place for the living, but is anything but restful for the spirits that are said to linger there. Here, you will learn many interesting facts regarding the haunted Brown Palace in Denver, Colorado. The haunted history of this hotel is a long and rich one. It is understood that up until around the year of 1985, there were several people who made this luxurious home their permanent home. This was made possible by the apartments that were constructed in the top area of the structure. There was one resident, in particular, that seems to draw on the attention of historians and those that are interested in the haunted history. This resident was the lady by the name of Louise Crawford Hill. This lady was a largely influencing person when it came to the society of Denver in the fifteen years that she lived in the Brown Palace. Unfortunately, Louise suffered from tremendous heartbreak in her life. As the hotel gained popularity, historical tours were given within the structure. When the tours reached the room of 904 where Louise resided, the stories of her devastation were expressed. Shortly after this, despite the fact that there were no lines for a telephone in the room, the individual who worked as the operator in the building began to receive calls that were filled with nothing but static from the room. It is believed that Louise’s sadness was ignited by the historical tours and that she still resides in the building. There is a room in the hotel that was once referred to as the “ San Marco Room ”. It was a room that was known to provide entertaining social gatherings and music to guests. Eventually, it was transitioned into a hotel dining room. In today’s world, it is referred to as “Ellyngton’s”. Many bands performed in this room throughout the history of the structure, and it appears that one band has elected to stay. When going through the building one evening, an employee identified noises emerging from the room. He went to inspect it, ensuring that everything was in order. What he discovered was a musical band that appeared to be practicing an assortment of musical pieces. While a bit surprised by his findings, he calmly informed the band that they had to dismiss themselves from the location. They appeared to be solid and real, and not ghosts. The spirits then informed him that they lived at the establishment. Shortly thereafter, they simply vanished! As you can see, there are many stories circulating the Brown Palace in Denver, Colorado that revolve around unexplained phenomenon, ghost stories, hauntings – you name it! If you will be in the area of Denver and are looking for a haunted place to go, this hotel is a choice that I am sure you will be content with. Be sure to bring along your camera and camcorders so you can capture some ghost pictures and ghost videos in the haunted hotel on your visit! 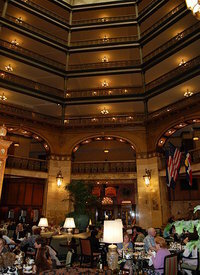 Check for the lowest price, get directions, view photos, and read the reviews and traveler tips for the Brown Palace Hotel.